(Joshua Paladino, Liberty Headlines) Organizing for Action, the nonprofit organization that helped Barack Obama win reelection to the White House in 2012, has partnered with former Attorney General Eric Holder’s political action committee, the National Democratic Redistricting Committee. They plan to influence elections in Republican-controlled states with strong Democratic leanings, such as Wisconsin, where they are targeting Gov. Scott Walker and the soon-to-be vacant seat of House Speaker Paul Ryan, R-Wisconsin. “With this new partnership, Organizing for Action [formerly Organizing for America] and NDRC will join forces to reform the practice of allowing politicians to redraw our congressional and state legislative districts in ways that cater to political extremes and leave too many voters feeling as if they don’t have a voice,” the groups said. The joint operation comes as Obama has reappeared in politics, considering a larger role in organizing the Democratic Party for the 2018 and 2020 elections. He met with prospective 2020 Democratic presidential candidates, including Holder, last week. While the mission of the joint effort — to draw fair district lines — appears nonpartisan, the groups have raised millions for Democratic candidates. Most recently, the NDRC spent $175,000 on two special election campaigns for the Wisconsin state senate and assembly, the Wisconsin Gazette reported. Democrat Caleb Frostman won the Senate seat in District 1. The Journal Sentinel reported that Frostman is the first Democrat to hold the seat since the 1970s, prompting Democrats to prematurely declare a blue wave in the midterms. Democrat Ann Groves Lloyd lost to Republican Jon Plumer in the 42nd District Assembly race. Lloyd blamed electoral corruption for the loss. The NDRC said it raised more than $11 million in 2017, with much of the money coming from “mega-donors,” such as Fred Eychaner, Donald Sussman, Jon Stryker, Martha Samuelson, J.J. Abrams, and Katie McGrath who donated nearly $2 million combined, according to the Washington Post. 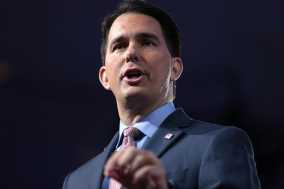 When OfA and the NDRC announced it would challenge Walker’s seat in order to have more executive control over the redistricting process in Wisconsin, the governor used it to spur conservative support. “If Wisconsin is going to win the 21st century, build on our success and push back against these Far-Left groups, we need your help,” Walker tweeted, according to U.S. News & World Report. The spokesman for the National Republican Congressional Committee Matt Gorman treated the announcement as an opportunity. The state Senate is controlled by an 18-14 Republican majority and a 64-35 majority in the state House. The Wisconsin governor can veto district maps created by the legislature, making the election ever-more important for the NDRC. Republicans have controlled the Wisconsin legislature since 2011, when they drew the state’s current districts that is before the Supreme Court in a partisan gerrymandering case. OfA and the NDRC have their sights higher than the Wisconsin state legislature. OfA released a list of 27 seats in the House of Representatives where the group plans to fight for Democratic victories. A spokesman for OfA Jesse Lehrich said the committee had to become involved in the redistricting fight because of the Republican Party’s unfair election practices. The NDRC is trying to reform the electoral system through the courts as well as elections. Holder’s group announced lawsuits to challenge districts drawn by Republicans in Alabama, Georgia, and Louisiana, AL reported. Suits filed in each state claim the district maps violate the Voting Rights Act by suppressing the impact of minority voters. The explicit goal is to give minority voters an electoral majority in each district so that they can vote for their preferred candidate without interference from white Americans. “The creation of additional districts in which African Americans have the opportunity to elect their preferred candidates in each of these states will be an important step toward making the voting power of African Americans more equal and moving us closer to the ideals of our representative democracy,” Holder said.